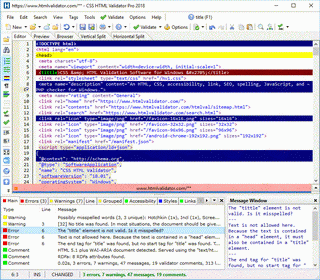 CSS HTML Validator is a commercial desktop software application for Microsoft Windows (that's been around since 1997! ), and it can help you with SEO. We've spent a lot of time reading and listening to expert SEO advice, and have taken the best of it and condensed it into a number of important tips, to-do items, and not-to-do items. We then integrated this into CSS HTML Validator. The standard, professional, and enterprise editions of CSS HTML Validator include search engine optimization (SEO) tips and analysis when this option is enabled in the Validator Engine Options. Keep reading to learn how to take advantage of the features that can help you improve your website's SEO and search engine rankings. CSS HTML Validator (standard edition and above) can generate a message with a page's keyword density. The keyword density message can be used to help optimize a web page for certain keywords and related themes and phrases. This will make it more likely that the page appears in the search results (and appears higher) when the keywords or related phrases are used in a search. However, be sure not to "over-optimize" (unnaturally use too many keywords) or search engines may penalize your website. NOTE: Where and how keywords are used is much more important than how many times they are used. Therefore, strive for good placement and natural usage over packing in the keywords. Use the link checker in CSS HTML Validator periodically to check for moved or broken links on your pages. This is important because over time links can change, move or break. Search engines may penalize websites that contain broken links or aren't kept up to date. Use the spell checker in CSS HTML Validator to check your website for misspelled words which can give a bad impression to your visitors, cause a loss of trust, increase your website's bounce rate, and even affect search engine rankings. This is because a lot of misspelled words can signal a low quality site. Make sure your website's grammar is correct as well. Below are some SEO tips that are generated by CSS HTML Validator (if enabled). Note that some tips may be debated by SEO experts. Only the engineers behind the search engine algorithms can truly know all the details of how pages are ranked. Furthermore, the algorithms are constantly changing so what may be important advice one day may be useless or less relevant the next day. QUALITY CONTENT IS MORE IMPORTANT THAN EVER! The actual content of a page (the text that a visitor sees) is VERY important. Ensure that the content is high-quality, useful, and information-rich so that visitors will want to read, share, and link to it. Avoid fluff. Include keywords and search terms throughout the content when appropriate (preferably sooner in the text rather than later). For best results, use original content of at least 300 words in each page. DID WE SAY QUALITY CONTENT? Provide quality, well-written, and original content that people will want to link to and share. Some search engines may use advanced spelling and grammar checkers to try to detect quality content and eliminate junk, so be sure to check spelling and grammar. The more quality content on your site, the better. USE KEYWORDS, SEARCH TERMS, RELATED PHRASES, ETC. Use keywords, search terms, and related phrases and themes throughout the page, including in regular text (but preferably sooner rather than later). However, don't overdo it. Make sure that it reads naturally and isn't cluttered with terms and phrases that make it seem written for the search engines rather than for users and visitors. DON'T TRICK. Never do anything for the purpose of trying to trick a search engine. Tricks can often be detected or be reported to the search engine by a competitor. DON'T PLAGIARIZE. Search engines are getting better at detecting similar content, even when changes are made to avoid detection. Ensure that your content is unique by varying topic order, using multiple sources, and adding to or improving the content. DON'T OVERDO IT. It can be a fine line between good optimization and over-optimization. Don't try too hard (like using keywords too many times) or you could 'over-optimize' which could (possibly) result in a penalty. WATCH WHO YOU LINK TO. Be careful who you or your users link to. Avoid linking to bad or untrustworthy sites that might damage your site's trust and rank. Add rel="nofollow" to any links that are in untrusted content, like user comments, forum posts, or guestbook entries. USE UNIQUE TITLES WITH KEYWORDS. Each page on a site should have its own unique title. Every title should contain appropriate keywords and search terms that are relevant to the page. Don't just stuff keywords in the title. The first words in the title are more likely to result in higher rankings than subsequent words, so use important keywords at the very beginning when reasonable. The title should also be something that a user will want to click on when it's listed on a search engine. A good title is also important when a visitor bookmarks a page. USE THE "ALT" ATTRIBUTE. Using the "alt" attribute for images is not just good for accessibility, it's good for search engines too. Use the "alt" attribute to describe images but use relevant keywords and search terms in the description when appropriate, but don't overdo it by cramming in too many keywords. Consider using/adding graphic images, photos, or illustrations on important keyword-targeted pages with the important keywords used in the alt text. USE THE "TITLE" ATTRIBUTE. Many elements support the "title" attribute that is used for annotation (do not confuse the "title" element with the "title" attribute). Consider annotating tags like "a" with something like title="Read about <keywords>". Annotate with keywords and search terms. Some browsers, like Firefox, will also display the value of the "title" attribute when the user hovers the mouse over content with a "title" attribute. DON'T HIDE TEXT. Do not use hidden text or keywords, small text, comments, popular but unrelated words, or any other shady SEO practice to try to 'cheat' to gain better search engine rankings. This is dishonest and considered to be a type of search engine spamming. Many search engines penalize sites for spamming as soon as it is detected. USE SEO-FRIENDLY SCRIPTING. Avoid using client-side scripting to insert or write tags and content into web pages. Don't use client-side scripting to link to other documents. Search Engines don't run client-side scripting. It's also a bad idea because it should not be assumed that scripting is available (and turned on) in the user's browser. MAINTAIN CONTENT QUALITY. Provide fresh, unique, original, and relevant content from time to time to keep your site content from "decaying". Avoid "thin content"; most content should be at least 600-700 words. STAY ACCESSIBLE. Following accessibility standards may improve search engine rankings. Use "alt", "title", and table "summary" attributes whenever relevant and possible. Use keywords and search terms in them but keep them accurate. Using this program's accessibility checking can help. CONSIDER THE QUERY STRING. Don't use "&id=" as a parameter in URLs as some search engines like Google won't include these URLs in their listings. LINK TO QUALITY SITES RELATED TO YOURS. Consider linking to one or more high ranking sites that are related to the site you're promoting. Use your site's keywords in the link text if you can. USE YOUR SERVER LOG. Look at your site's referral logs to see what keywords people are using to find your site. Use this information to improve your site. For example, you may want to add content related to keywords that have been overlooked. DON'T KEYWORD STUFF. Don't use keyword stuffing. Keyword stuffing is inserting blocks of keywords to try to increase a page's rankings by increasing its keyword density. This is considered spamming and can easily be detected. Example: keyword1 keyword1 keyword1 keyword2 keyword2 keyword2 keyword3 keyword3 keyword3, etc. BEWARE OF FLASH. Be aware that using Flash causes issues for search engine spiders because they are unlikely to be able to see and index the text content in a Flash object. Use alternate ways of making Flash content available to search engines, such as including links to alternate pages that do not use Flash objects. This will also be helpful for visitors who are unable to view Flash content. WHEN NAMING NEW PAGES... When creating and naming new pages, consider using important keywords in the page name, as well as using hyphens (not underscores) to separate the keywords. USE SHORT URLs. Shorter URLs may perform better in search results and are more likely to be copied & pasted, linked-to, and shared. USE GOOD HEADLINES AND HEADINGS. It may be a good idea to repeat a document's title, keywords, and search terms in heading elements (like "h1", "h2", etc. ), but don't overdo it and make sure it looks natural (although some experts now say this carries little weight). Headlines and headings should attract a user's attention and should always be used appropriately. Use CSS to make them look good, but do not change the meaning of the heading elements, like making a heading look like regular text because that can be considered cheating and may result in a penalty. REMEMBER IMAGE SEARCHES. Image searches can be a significant source of visitors and traffic. Therefore, try to use keywords when naming images, and separate keywords with hyphens (not underscores), but don't overdo it by stuffing in too many keywords. USE GOOD PAGE TITLES. Each page on a site should have its own unique title. Every title should contain appropriate keywords and search terms that are relevant to the page. Don't just stuff keywords in the title. The first words in the title are more likely to result in higher rankings than subsequent words, so use important keywords at the very beginning when reasonable. The title should also be something that a user will want to click on when it's listed on a search engine. A good title is also important when a visitor bookmarks a page. USE RELATED VARIATIONS. Try to use related keyword, term, and phrase variations throughout the page, but remember to keep it natural. Read the text aloud to make sure it sounds normal and natural. STAY CRAWLABLE. Keep sites and content crawlable and discoverable. Don't rely on content and links in Flash, Java, Ajax, etc. that is difficult for search engines to see and follow. Content that search engines can't access cannot be indexed. Also, use sitemaps (an XML file with a list of the pages on your site) to ensure that search engines know about all the pages you want indexed. DON'T DUPLICATE CONTENT. Never use duplicate content just to try to improve search engine rankings or to try to fool search engines. Search engines do not like duplicate content and will try to filter such content out from search results. REPEAT NATURALLY. It's a good idea to repeat a document's title, keywords, and search terms throughout the page (preferably sooner in the text rather than later), but do it appropriately and make sure the page sounds natural when read aloud. GET GOOD BACKLINKS. Get sites that are popular, relevant to your own site, and have good rankings to link to your site. The anchor text that is used to link to your site is also important and should contain your site's keywords and search terms. Building incoming links gradually instead of all at once (which can look spammy) may also be better. GET GOOD REVIEWS. Ask your happy customers to write honest reviews for your service or products on major review sites. MORE ABOUT GOOD BACKLINKS. Quality is much more important than quantity. Try to get good backlinks and avoid bad backlinks. Backlinks should look natural and should never be bought. Beware of keyword rich anchor text because this can look spammy (use the page's title, domain name, or bare URL over spammy looking anchor text). And yes, competitors can attack your site with bad backlinks. BE MOBILE FRIENDLY. Make sure your website is responsive to browsers on smartphones and tablets which have smaller screens. Websites that are not mobile friendly may be penalized, especially for searches done on mobile devices. Test using Google's PageSpeed Insights. MONITOR WHAT PEOPLE SAY. Use Google Alerts or a similar service to monitor what people are saying about your website, service, or products. This is an opportunity for you to reach out and knowledgeably address any complaints, criticisms, comments, praise, or discussions regarding your offerings. Try to resolve any complaints and say 'thank you' for compliments. USE META TAGS. Use meta description and keywords tags in the head section. While some search engines may not use these tags (especially the keywords tag), some do. For example, Google often uses the page title and meta description in the search results. DON'T CLOAK. Cloaking is delivering search engine optimized content to search engine spiders while delivering different content to actual human visitors. Many search engines can detect this type of spam and may even completely ban a site if cloaking is detected. DON'T WASTE TIME COMMENTING. Don't waste time stuffing content or keywords into HTML comments because it appears that search engines ignore text in HTML comments. AVOID BAD BACKLINKS. Avoid backlinks from link farms that are designed to deceive the search engines and never pay for backlinks. Having these and other low-quality backlinks may result in your site being penalized. Instead, strive for quality backlinks from a wide range of high quality, relevant pages. AVOID DOORWAY PAGES. Do not create doorway pages that don't add clear, unique value for the user. Do not create pages simply designed to funnel search engine traffic to the actual usable or relevant portion of your website. STAY FAST AND RELIABLE. Ensure that your web server is fast and reliable with as close to 100% uptime as possible. Slow or unreliable servers could negatively affect search engine rankings. Consider whether using a dedicated (instead of shared) server would be beneficial. SPEED UP. Speed up your page using the Google PageSpeed Tools (like PageSpeed Insights for mobile and desktop). USE CANONICAL URLs. Ensure that search engines think you have only one site by using 301 redirects to a canonical (preferred) URL when appropriate. For example, if using the www form of a site name, like www.domain.com, then redirect http://domain.com requests to http://www.domain.com (and vice versa if using the non-www form). USE A SITEMAP.XML FILE. Use a sitemap.xml file that lists all indexable pages, and update it regularly. Make sure search engines know about it. A website can still be indexed without this file, but a sitemap.xml file can help crawlers find content that they wouldn't have otherwise found. KEEP GOOGLE HAPPY. Make sure your website stays in compliance with whatever Google thinks and says is good. Comply with Google's terms of service and stay in conformance with their webmaster 'best practices' guidelines (note that this can be a constantly moving target). REGISTER YOUR DOMAIN FOR 3 OR MORE YEARS. Register your domain name for at least three years. A longer registration time means a more credible site (it's less likely to be considered a spam site by search engines). Note, however, that there is debate about this and some people think this is a myth or that registration length is not significant. Visit the SEO section of our resources page for more helpful SEO related websites, tips, and other resources.